The AWS Summit in Chicago this week kicks off an international tour of dozens of Summits from New York to Tokyo this year, culminating with AWS re:Invent in December. At today’s conference Amazon Web Services GM of Product Strategy Matt Wood announced new features for the cloud platform. But one thing that was not officially discussed has been a rumored product that could give Amazon partner reason for concern. Amazon Inspector is a product launched last year that will automatically scans customers’ cloud environments to help identify and improve security and compliance. Inspector runs security vulnerability assessments and providers users with a detailed list of prioritized security findings. Amazon announced that Inspector is now generally available across its cloud. Amazon is making it easier to get data into its cloud and move data around its cloud. The Amazon Simple Storage Service (S3) Transfer Acceleration allows users to connect their end point (such as a data center or desktop) to an AWS edge network point of presence. New optimized network protocols improve cross-country transfer rates by between 50% and 500%, Amazon says. Last year saw the introduction of AWS Import/Export Snowball, a hardware appliance AWS sends to customers to load up with data, which are then sent back to Amazon for rapid uploading of data to the cloud. Previous Snowballs capped at 50 TBs, new Snowballs announced today are 80 TBs. AWS also expanded the regions of its cloud that Snowball data can be uploaded to, including GovCloud. Amazon EBS is a core block storage service that already has a handful of flavors, including SSD general purpose, EBS Provisioned IOPS and EBS Snapshots to S3. Today, AWS announced two new Volume Types: HDD Throughput Optimized (st1) and Cold HDD (sc1). St1 is designed for high throughput applications, such as MapReduce or Kafka and costs $0.045/GB/mo. Sc1 volumes are for those same types of workloads that are accessed less frequently and starts at $0.025/GB/month. Many of Amazon’s announced involved helping customers migrate applications to the cloud. When doing so, it’s imperative to define the components of an application and all its dependencies. That’s what AWS Application Discovery Service does. A preview of ADS will be available soon. AWS Elastic Beanstalk is a platform for automatically deploying and running apps on Amazon’s cloud infrastructure. The service automatically configures infrastructure and monitors the health of it. Newly announced Managed Platform Updates allow developers to schedule regular platform updates of apps managed by Beanstalk. AWS Device Farm is a nifty little tool that allows mobile app developers to test their code on mobile devices hosted in Amazon’s cloud. Today, AWS announced that users have the ability to remotely access and control those devices, meaning you can swipe, gesture and interact with them. Amazon Cognito is a service for adding authentication, user management and data synchronization in mobile apps. Today, Amazon announced User Pools, which allows mobile app developers to more easily manage sign up and sign ins of mobile apps. Directories of hundreds of millions of users can be created to help manage authentication. Amazon Kinesis is a product that allows users to manage data that is streamed into the cloud (it can be used to manage click-stream data on a retail site, or insight data in a game for example). Today, Amazon announced that Kinesis data can be streamed into Amazon Elasticsearch Service, Amazon’s hosted version of the popular open source search and analytics service. Amazon added enhanced metrics to Kinesis, allowing shard-level metrics to be sent to Amazon CloudWatch, AWS’s monitoring service and it added Time-based Iterators, which will give developers more flexibility in managing timestamps when organizing data. CRN reported last week that Amazon Web Services is working on a new product –code named Sentinel – that will help users manage their infrastructure resources. 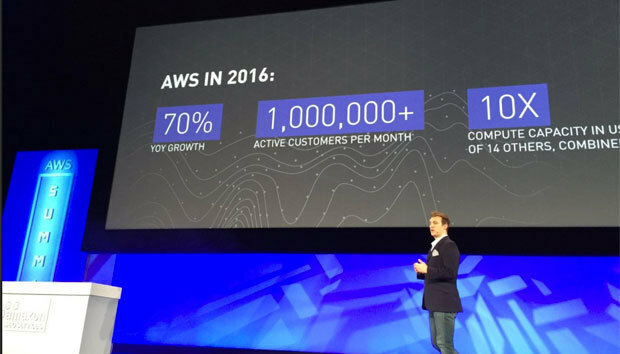 If launched, this could be a bad sign for the broad market of managed service providers who offer support of AWS. It wouldn’t be the first time Amazon has introduced a product that competes directly with its partners though (AWS Trusted Advisor is a prime example).